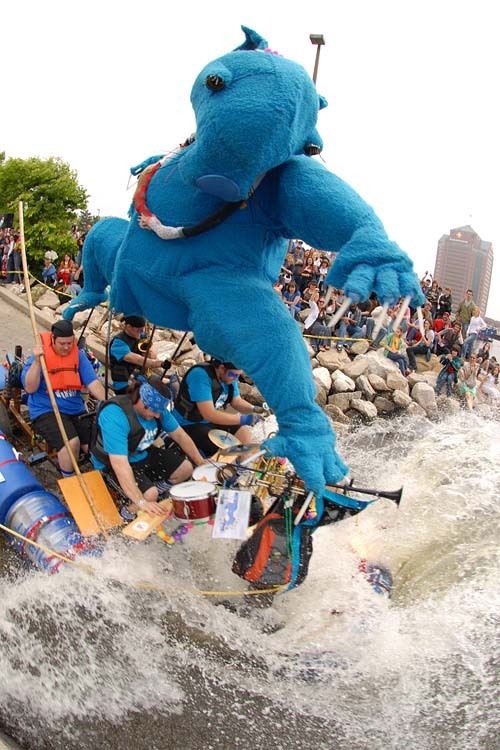 With thousands of witnesses, the world’s first human-propelled blue wombat New Orleans jazz band made its amphibious debut with a high-velocity plunge into the Baltimore Harbor. If there were any more creativity squeezed into one instant, it would collapse into a singularity. 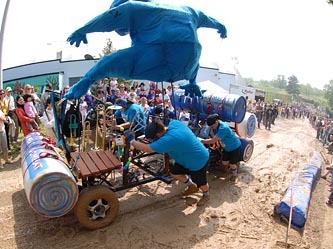 They paused the music to brace for acceleration into the water, then plunged into the harbor with such force that both air-filled 55-gallon flotation drums on the front of the sculpture were completely submerged. Their crowd-pleasing Dixieland sound surged back once they were cruising on the water. The WOMBATS were a huge hit, a fabulous advance in the Multisensory Kinetic Arts. They easily won the People’s Choice award, for the people are wise. 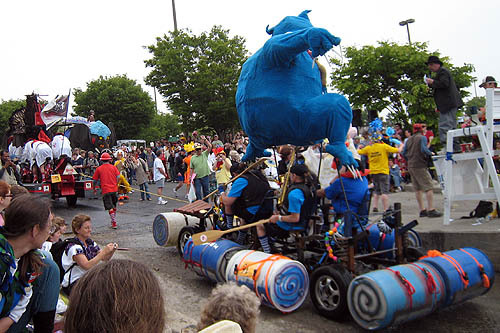 Last year’s 1-seater Blue Wombat returned as the 4-seater Wilma & The WOMBATS (Wayward Outcast Musicians Battling Apocalyptic TribulationS). Here it’s being towed by the PLATYPUS out of the water. Wilma has the transmission from a Toyota MR2, with 2-wheel drive. Wilma and the PLATYPUS are the work of Kinetic Genius David Hess of Phoenix, Maryland. 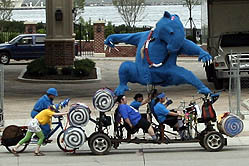 Sculptures have often played music during the race—but using recordings and a stereo. 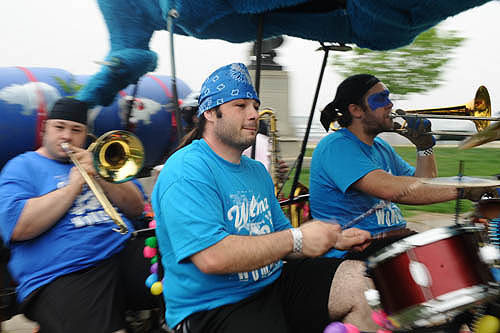 Wilma’s WOMBATS, however, are a seriously good band that played New Orleans jazz as they drove the sculpture. 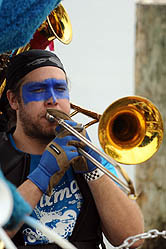 The lead WOMBAT was Aric Wanveer on the trombone. 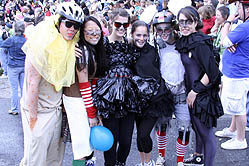 Their pit crew were Hereford High School students costumed as Australian animals. Wilma is more sculpted than most entries. The dramatic stance, muscle tone, and posture give Wilma a great deal of exciting character.